A delicious Taco Casserole that will satisfy those Mexican food cravings and is easy enough to whip up on a weeknight! 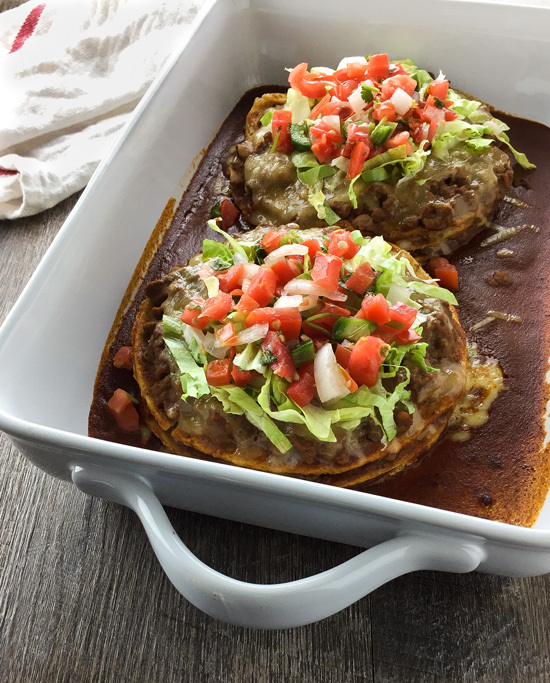 Corn tortillas layered with refried beans, seasoned ground beef, and Monterey Jack cheese. Well, here it is! 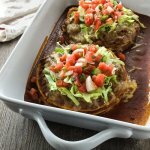 As I promised in my Homemade Enchilada Sauce post, I have a recipe for you to use it in. And it’s a good one! I mean it’s kind of hard not to be tasty when beef, cheese and Mexican flavors are involved, right? Some of my favorite cooking magazines are from the people at Cuisine at home. Specifically, the thicker ones you can get at Barnes and Noble. They have pictures of every recipe, which is just one of the reasons I love the magazine. The other one is that they always have great sounding recipes. Anyway, that issue is where the idea for this Taco Casserole recipe came from. I’ve adapted it some to suit my own personal taste, and I think it turned out super yummy. This can be on the dinner table in about 30 minutes, so it’s something you can whip up even on a busy weeknight. If you like, you could also make some of my Easy Mexican Rice to go with it. *If you prefer, you could make this with ground chicken or turkey. I just wouldn’t recommend using ground chicken breast or turkey breast for this dish. A delicious Taco Casserole that's easy enough for a weeknight meal and super tasty! Corn tortillas layered with refried beans, seasoned ground beef, and Monterey Jack cheese. Heat oil over medium-high heat. Add the onions to the pan and cook for a couple of minutes. Add the ground beef and cook until completely browned, breaking up the meat with a spatula or spoon as it browns. Reduce heat to medium. If using beef with a higher fat content, drain all but 1 tbsp of grease from the pan. Add the chili powder, cumin, garlic powder, onion powder and sea salt and stir to coat the mixture. Stir in the refried beans and 1/2 cup of enchilada sauce and cook until heated through, about 1 minute. In the bottom of the baking dish, spread 1/2 cup enchilada sauce. Pour remaining enchilada sauce into a plate with high sides or shallow bowl. Dip two tortillas into sauce and place side by side into baking dish. Top each tortilla with about 1/2 cup of meat mixture and 1/3 cup of cheese; repeat process 2 more times. Bake casserole until cheese is melted, about 15 minutes. Garnish with shredded lettuce and Pico de Gallo . It's possible you might have a little bit of the meat mixture left. Use it to top or stuff an omelet in the morning! *If you prefer, you could make this with ground chicken or turkey. I just wouldn't recommend using ground chicken breast or turkey breast for this dish.